"Quality and a name you can trust at prices you can afford!" American Air Masters, Inc. specializes in residential air conditioning and heating repairs and new installations. Serving the Southlake, Texas area, we will promptly and professionally be at your service to provide you with the best solutions to your air conditioning and heating needs. We service all makes and models, offer same day service in most cases, and provide a comprehensive preventative maintenance plan. We are also happy to provide custom attic insulation installs using AG Foam Insulation. Please call us for further information regarding attic insulation. As an American Air Masters, Inc. customer, you will also have the peace of mind that each one of our air conditioning and heating technicians are EPA certified and in compliance with all installation standards as established by Lennox, American Standard and Rheem. We also offer six-month, same as cash financing as well as other finance plans. 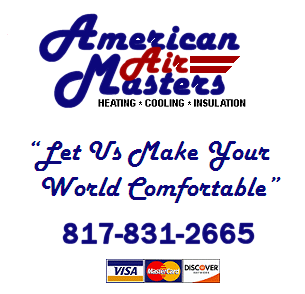 At American Air Masters, Inc., it is our goal to always remain on the cutting edge of the air conditioning and heating industry. We will always be affordably priced and continue to deliver an expert opinion with a smile. Because we are family-owned, we understand the values of integrity, dependability and affordability. From our family to yours, we invite you to tour our website. It is complete with a products page and a frequently asked questions page so that you can get some answers to the most common questions we hear. If you have any questions or would like to schedule a service call or free consultation on new equipment, please contact American Air Masters, Inc. at 817-831-2665. For honest, reliable and fast service in Southlake, Texas, call American Air Masters, Inc. today! Thank you for your interest in American Air Masters Inc. We look forward to serving you in the future! American Air Masters, Inc. is proud to serve the Fort Worth, Texas, area including the cities of Arlington, Bedford, Blue Mound, Colleyville, Euless, Grapevine, Haltom City, Haslet, Hurst, Keller, Kennedale, Lake Worth, Mansfield, North Richland Hills, Pantego, Richland Hills, River Oaks, Saginaw, Southlake, Watauga, and White Settlement. American Air Masters, Inc. is proud to provide honest, reliable and fast service. We are confident that you will be pleased with the services we provide.